Please check out my Current Burmilla litter on Kittens Currently Available page and my Retired Adults too. All are Registered in CFA. Navigational Buttons are at the bottom of each page and each page has a Pink e-mail cat botton to e-mail me from. Just a fyi (for your information), Burmillas are great kitties, but if you are not home all the time, they need a buddy or they get lonesome. If you are a stay at home business, Mom or Dad, then 1 Burmilla is okay, but if you go on trips or out for hours during the day or night, then you need to have another pet for these guys to snuggle or play with, when you are not there. My Cats (from Bes Cattery) are a Hobby and not a Business, I only Accept payments made out to me. I have DNA Tested my cats for PKD (when it first came out, back in 2006) and Hypo-Kalemia. I will not Breed from Affected cats (that means cats which have tested Positive, or has 2 genes). If I have older kittens or younger cats that need to be placed, please do not tell me that you will only pay $400.00 for that kitten or cat, since my spaying/neutering and Microchip costs, are close to that amount. The only time I might have an older kitten or younger cat at that price is if I had one returned to me and I'm trying to recover the cost that I've incurred, while they are in my care. I do not resell a kitten or cat that has been returned to me, at my normal price, ever. Bes Cattery is owned by Kim & Phillip Ghobrial of Beaverton, Oregon (close to Portland). We have been breeding cats since 1983. We got into breeding cats with the idea "To Better the Breed". We have always strived for clean Health, Personality, and Longevity, with Show quality as a bonus when we get them. We won't compromise the Breed to get a fast win. We believe that outcrossing is the way to go in keeping the Breed alive. 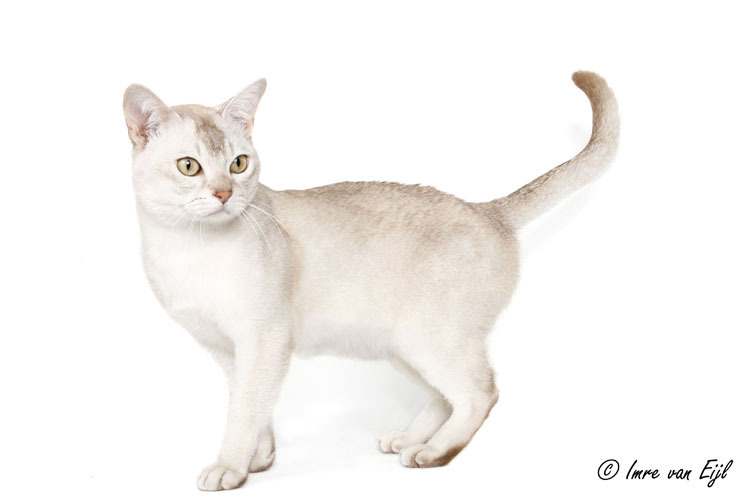 We use to breed Abyssinians (both Normals and Silvers), Somalis, Egyptian Maus, Mainecoons (for a very, very short time) and European Burmese. I breed the Burmillas and occasionally Burmilla Longhairs (also known as Tipped and Shaded Tiffanies in some Organizations). Since we breed the Burmillas and have the earlier Generations which we work with, we occasionally will have other Patterns which pop up in the litters, such as Selfs (Solids), Smokes and Silver Tabbys (Spotted, Classic, Mackeral and Ticked). This photo is of Kincsem's Krystal Lace, a Brown Tortie Shaded Silver Burmilla, 3rd Gen. and daughter of Aidan (left) and Hindmarsh Silva Aidan of Bes, a Black Shaded Silver Burmilla, 2nd Gen.(right). I live in a 2 bedroom apartment and it is always clean and I have all my adult cats and kittens that I keep, tested Negative for Leukemia and the Aids Virus. I do keep my number of cats or kittens always down, because I want to give everyone enough love and attention that they need to make them happy. I do have an answering machine and I will call you back, if you leave a message. If I'm on the phone, I had turned off the Answering part of Comcast services, so you might get a mechanical Voice saying that the phone number you just called is no longer in service, which isn't so, just call me back please. I do ship any where in the United States and Internationally. After you take a tour of my pages, if you have any other questions you can e-mail me. These are my cats, that I'm keeping for my breeding program. This page has pictures of Burmillas both Shorthair and Longhair (also known as Tiffanies), along with some Breed History. Also, I have some photos of my cats and kittens that I've had in the past on here. This page has information for kittens that are bought as Pets or Breeder Quality. It has approx. prices on the Airline fees and Health Certificate fees. Also, I have information about Shots and why I won't give my kittens shots, with exception to the Rabies Shots, due to shipping to some States which require it. I have been doing Homeopathic Nosodes from 3 weeks old on and they work. This page is for photos of all the cats or kittens that Pet Buyers have bought from me. Kind of like showing off their kitties. I do not keep a waiting list any more, it just doesn't work out well. I have photos of the 1 Available kitten and I've put Yin Ye and Q over on my Retired page and they are available. I have Yin Ye and Q that are available, photos are up. I have a Sterling Silver Abyssinian Pendant by Precious Pets available. Also, there is a hyperlink to my Etsy Shop called, Kims Gem Creations. 1st is: "I love my kitty" - I cry every time I read this. This is a must read. 2nd is: "I am your cat" - This is a very beautiful and poignant piece. Stop by and read it.